I took a crashed hard drive home from work on Friday, intending to strip it and use the platters for a project I am planning. While I was stripping it I decided to make a photo opportunity of it. 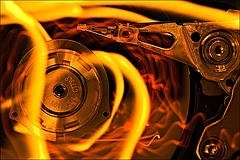 This entry was posted in Photos and tagged computer, disk, drive, Light. Bookmark the permalink.